I learned the truth of the matter, or at least an interpretation of it when our group made a stop at Loch Lomond for a short cruise. Any idea what bonnie braes are? Would you wont to gae there? The lads who ran the boat knew that sometimes the tourists had a wee bit of trouble interpreting their colorful vernacular. They thoughtfully provided a tea towel with a few translations. Or maybe they just had a sense of humor. They really weren’t that hard to understand when they stuck to conventional dialect. Although this verse doesn’t appear in all the versions, we now come to the heart of it. Why is our woeful singer being parted from his true love? And who’s this Charlie Stewart fellow? Is he the dejected lover? Let’s go back a ways. You’ve no doubt heard of Mary, Queen of Scots and her rivalry with Queen Elizabeth I, with QE I getting the better end and Mary getting the sharper end. However, while QE I won that battle and ruled for many years, she died childless. And who ended up with the crown after Elizabeth died? Mary’s son James, then King James VI of Scotland, becoming King James I of the UK. This united the rule over Scotland, Ireland, and England beginning in 1603. And what was the family name for Mary, and James the VI/I? Stuart. So the Stuarts were in the driver’s seat, and figured they’d be Kinging it until the end of time. Unfortunately for them, the end of time was 1688, when James II was deposed by the English parliament and William III, Prince of Orange. This didn’t stop them from thinking they should still be the rightful Kings of Britain, even though they were hiding out in France and Italy. Fast forward to 1745. The current Stuart, Bonnie Prince Charlie, had come out of hiding and started the Jacobite rebellion in Scotland. 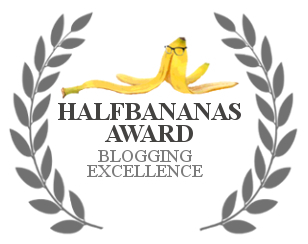 (More about that in a future post.) To make a long story short, the English put down the rebellion, and dejected Charlie was on the run. Part of this run took him to Loch Lomond, where he hid out in a cave for a time. Our Captain pointed out this cave as we cruised by. From the lake, it wasn’t obvious there was a cave by looking at the rocks on the shoreline, except that someone spray-painted the word “cave” on the rocks. Presumably, that handy sign wasn’t there when the British troops were looking high and low. Eventually, his royal bonniness made it to the Isle of Skye where he caught a ship to France, and the Jacobite rebellion was no more. As to why he’s a Stewart rather than a Stuart in the song lyrics I’m cribbing from (swiped from Wikipedia), I don’t know. Perhaps it’s poetic license. I must remember that the next time I misspell something; I’m just being poetic. But Prince Charlie’s adventuring still doesn’t explain the lovelorn lament that sets the tone for this song. As far as we’ve seen, he was a fighter, not a lover. While Charlie escaped the aftermath of the final battle at Culloden, not everyone was so lucky. Many were captured. Some were killed on the spot, and some taken to England for show trials. Many were condemned. There are several interpretations for this song. One of the darker ones has it sung by the lover of a condemned prisoner on their last visit before he is killed, or perhaps in memory after she’d returned. The English displayed the heads of the condemned rebels on spikes along the “high” (more important) roads, while reprieved rebels and family members returned via lesser, “low” roads. It could be she sang of that in her lament. I’ve heard bits and pieces of this song my entire life, but never knew anything about it or what it was about. Thanks for educating me! Thanks, Biff. That’s about where I was with the song before the trip, so we’ve learned together. Indeed we did! Thanks again for sharing it. 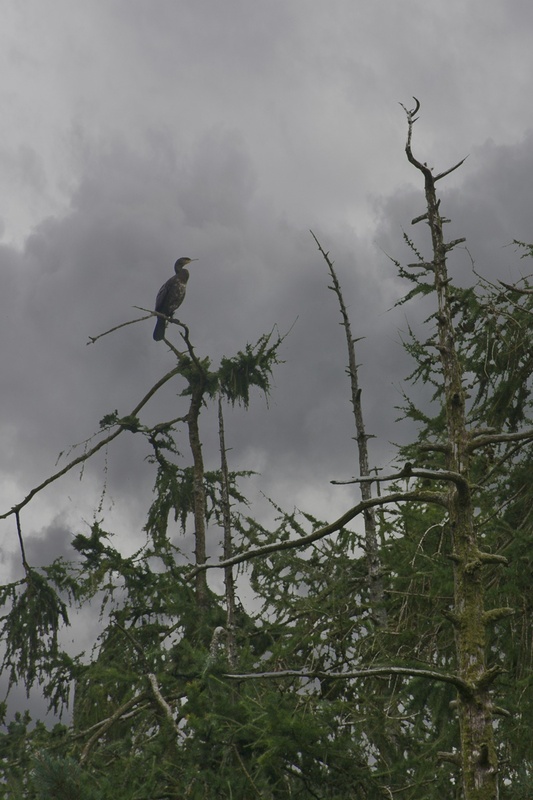 A sad story, quite a bit of poetry, wonderful photos about the loch, where all these tragical events took place, all these things made up the recipe for a very interesting post, Dave. I can’t take any credit for the poetry, some Scottish fellow came out with the tune in 1841, and even that was based on an earlier Scottish lament. It seems there was a fair amount of tragedies in Scotland’s past, I’ll touch on that a bit more as this series goes on. I know the song by heart, and have forever. This is a wonderful post. Thank you. Thanks, Cindy. Nice to see you stop by again. 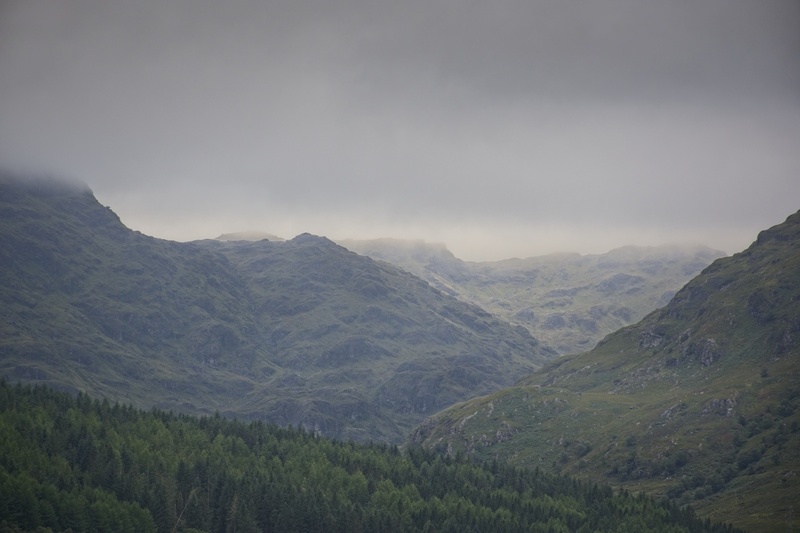 Such moody and evocative landscapes, with the poetry to match. Isn’t it interesting the variety of interpretations of the English language? I did go with a darker, greyer tone on the editing, in part because it was that sort of day and in part to match the interpreted tone of the tune. 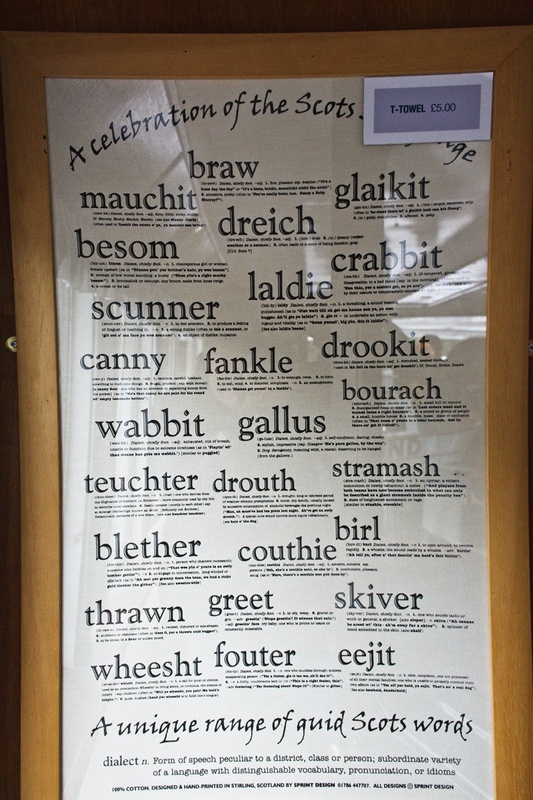 I wonder how much the Scots dialect is affected by Scottish Gaelic? So much of that history washed over me when we were there last, nice (and thankful for) the recap Dave, and the cool photos! Hi, Bill. I guess that’s one thing about going on guided tours – the guides fill your head with facts, stories, and history, and occasionally enough sticks that you can remember to look it up for blog posts! Glad you enjoyed the share, with a few pics to set the mood. Always loved the song but I never understood the underlying message. Thanks, it now means so much more. That’s about where I was too. I remembered just enough of the story from the trip to look up different aspects of it, so I learned things writing this post as well. This is a wonderful album, I love all this misty, purple heather/prose, roamin’ in the gloamin’ stuff! And I like the oil painting effect on your last shot. You must be a poet at heart. I enjoy futzing around with various settings in various painting conversion programs, the results can be startling and it’s the closest I’ll ever get to actual painting. I also was reminded of Elmer Fudd when I saw “wabbit”. According to my hi-res (RAW) version of the tea towel photo, “wabbit” means exhausted, out of breath, unable to continue. I didn’t bother posting a hi-res version of the photo as most people don’t click through to see them. If there are any other words on the towel you’re curious about, feel free to ask. Thanks, MB. Who ever figured poetic lyrics and dry history would work together? Beautiful photos, Dave; I like what you did with the editing to bring out the Scottish mists and grays. 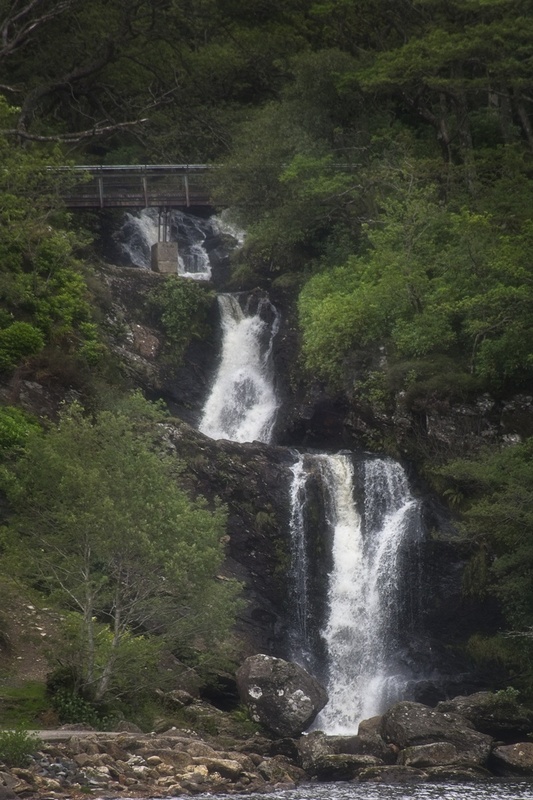 We have a great story of being completely unable to understand a man giving us directions in the Highlands, to the point where asking him to repeat yet again felt rude in that he was ostensibly speaking English! This was pre-GPS and we did eventually figure out where to go! I adore the vocabulary accent, though, and being almost half Scottish myself, I imagined a real connection with that harsh, bleak land and its gunmetal lakes. That reminds me of the first time I was in Scotland, back in 1980. I traveled via thumb, and for a time my hitchhiking partner was a Glasgow Scot I could barely understand – I’d constantly have to ask him to repeat himself. After we went our separate ways I caught a ride with another Scot who hardly had any accent. I asked him what the deal was. He said the accents were regional, you could travel 30 miles and they’d be completely different. I suspect social class might make a difference as well; one fellow had to hitchhike whilst the other drove a nice sports car, I suspect money and education might make a difference. Thanks, Curt. I mostly remember that song from my grade school days, which is to say I barely remembered the lyrics at all. But the melody is a real earworm, I wrote this post four days ago and the tune is still buzzing around my head. Love the editing on these photos, Dave. Like paintings. The Scottish accent and dialect is the most difficult for me to understand. It’s both beautiful and amusing to listen to, especially when they’re angry. 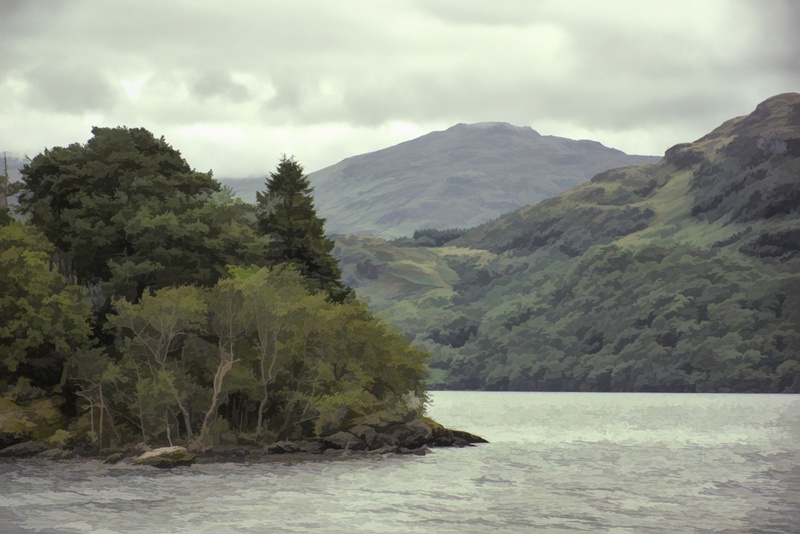 I once spent a few weeks working on one of the islands in Loch Lomond. Such a haunting body of water, even in the summer. Thanks for taking me back. Hi, Julie. The feature (and last) shot was created using a painting conversion program. It kinda felt right, since the song is likely made up and the historical aspect adds a certain patina to the story. For some of the others I used a little bit of a glow effect – kind of a misty, contrasty thing. You certainly have lived a varied and interesting life. 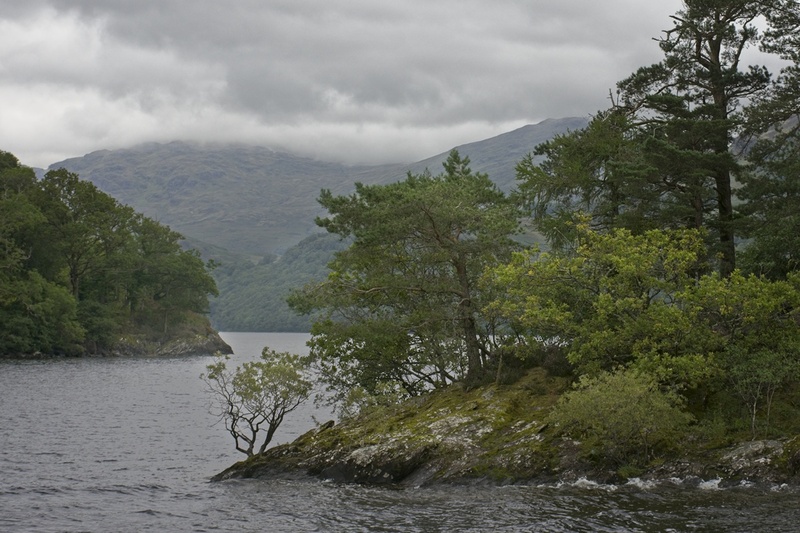 Ah, Loch Lomond. I’ve spent a few weekends around Glasgow when following a project there, and a walk around the Loch was always a good idea. Too bad it pissed with rain every. single. time. Gray weather and Scotland seem to go together like tea and biscuits. Of course, it’s not unusual around here either, this time of year. I don’t remember the last blue sky day. Gloaming! Thanks for a new word and a history lesson. And your photos really set the mood! 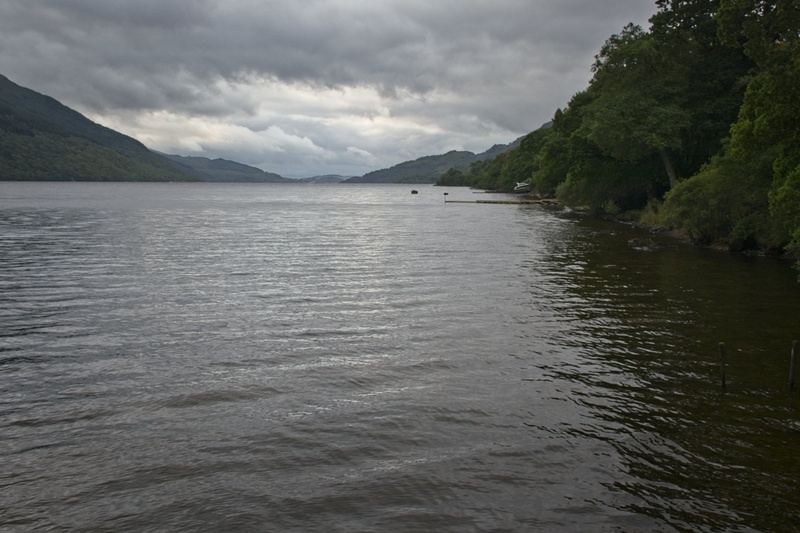 Loch Lomond is gorgeous–we’ve been there, and I’d love to go back:-) Thanks for the great trip down memory lane! Glad to trigger some good memories for you. Hopefully, more to come! We sang it in school – I remember that chorus, I always liked it. And no surprise that there are many ayers of meaning to be had from a song sung in that “gloaming” land. I’m beginning to think everyone of a certain age sang it in school. I wonder if they still do? It’s a good song, regardless of the interpretations. Always wondered what that song was about, never guessed the sad tale behind it. Seems like most folks tales/songs have a hint of melancholy. You must have had a blast taking pictures, such gorgeous scenery! I never suspected the real backstory either- didn’t really think about it I guess. The challenge that day was deciding what not to take pictures of. Thank you for a very moving post, Dave.